Download the free version now, and get started! 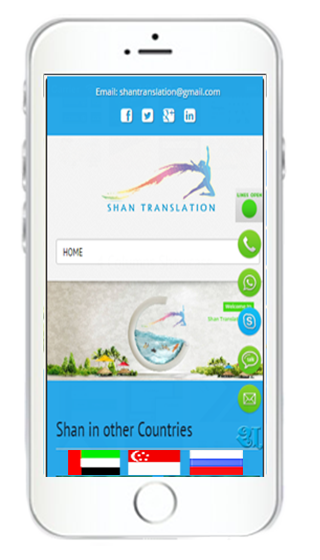 Shan Translation presents a Word Press Plugin which is a complete package of sliding icons for your word press website. Sticky Floating Icons is simple and easy to understand & configure. Sticky Floating Icons is a floating slider which can be used for almost all Word Press websites. Besides social network icons, it supports every icon-set that you can think of including all image extensions (eg. - .jpg, .png, .gif). Sticky Floating Icons also provides an option for additional image in the slider area to be used when necessary. Sticky Floating Icons is a unique product where the Sticky Floating Icons admin can create as many users and the users can switch themselves ON/ OFF as per duty timings. Mostly other plugins offered are available only with social media icons but Sticky Floating Icons can be used for almost all purposes. The plugin is compatible on all electronic devices (eg. – phones, tabs, laptops). Sticky Floating Icons has plenty of ready slider icon-sets to choose from; however you can create your own icons to suit your website. No limit to the number of icons you can use. Please install this free plugin with only the last icon which remains of the developer. All other functions are unrestricted unless you wish to pay for making the encoded label editable. Wishing you great business and lots of prosperity with the hope that we can add to it - in our own little way! WordPress Sticky Floating Icons, unlimited features! The most versatile slider plugin is here. Absolutely free except for manufacturers icon. How and why Sticky Floating Icons began? The concept came into being when we had a relay of employees logging in at different times using different phone numbers and email ids. The question arose as to how to inform the web visiting client – who is online at that particular time. Soon more reasons were adding up eg. How does a company announce different branches which come on line based on their country timelines? How does a doctor inform an ailing patient that he/she is ready for service? A team of experts looked at the options available and came up with the model which is presented in the form of the Sticky Floating Icons. on Plugins » Add New. You will see a screen like the one shown in the screenshot below. Find the plugin by typing the plugin name ‘Sticky Floating Icons’. Select the Sticky Floating Icons Plugin and click on ‘Install Now’ button. First, you need to download the plugin from the link https://shantranslation.com/shan.zip (which will be a zip file). 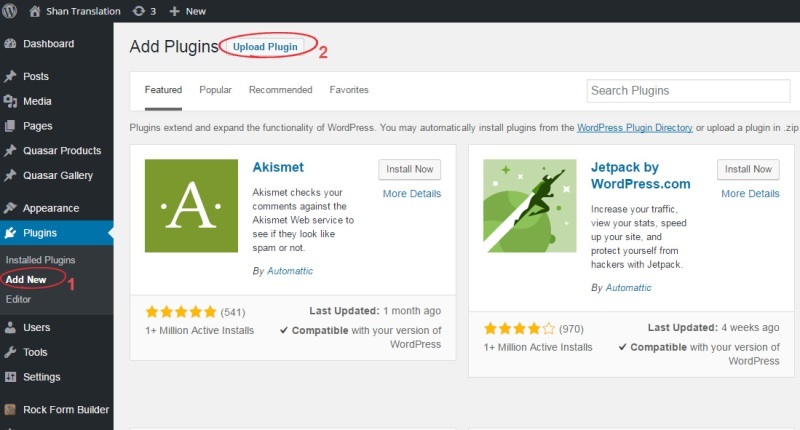 Next, you need to go to the WordPress admin area and visit Plugins » Add New. Click on the ‘Upload Plugin’ button (as shown) on top of the page. This will bring you to the plugin upload page. Here you need to click on the ‘Choose File’ button and select the plugin file you have downloaded earlier on your computer. After you have selected the file, you need to click on the ‘Install Now’ button. WordPress will now upload the plugin file from your computer and install it for you. You will see a success message like this one after installation is finished. Once installed, you need to click on the ‘Activate Plugin’ link to start using the plugin. Congratulations!! In WordPress admin area you will now see the plugin Shan Sticky Slider (as seen below). You can change font size, text color, background color, Icon Size and location. With the help of location you can set the slider on left or right side of your website. The only difference between the paid and the free version is that the lowest Icon and text becomes changeable. All other features remain the same. You need not pay until you have tested the plugin completely or if you are comfortable allowing the last icon to be as it is. Even after payment, IT IS FINE TO CHANGE YOUR MIND and we give you a full refund. All Paid versions are for single site only. Shan Translation Pte. Ltd. is a company formed in Singapore and manned by staff providing services from India. An organization of more than 35 people including developers and designers, translation handlers aim to provide the finest IT products and quality services. The primary work of the company is to provide translation, transcription and subtitling services to clients worldwide. The design of websites and tools used change often and although the plugin is tested on multiple Word press websites, all IT products work under technological constraints. Computers and websites behave differently and it is best to take a backup of any website before installing any program or plugin. We cannot accept any responsibility of each conflict that takes place on different templates. We will try to assist all our clients who install including the FREE downloaders. 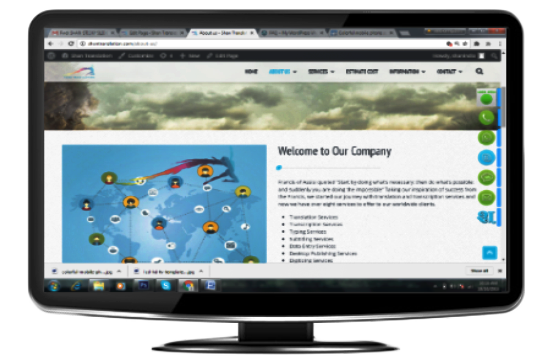 We do not assume responsibility of website malfunctions after the installation of Sticky Floating Icon. I have a php version website, how can I use this plugin? The php version will be out soon and is in a developing state. This plugin is made for word press users. Will I have to pay for the icons? You can create the icons in the .psd file that we have given, and no payment for the icons. Sure, you can use any icon you wish. Can I place large icons or images? Can I use no icons? Some of you may choose not to use any icons and only the small part of the label will show. Why do I need to create users? In many businesses and services there can be shifts and different people log in at different times. Only the admin has the power to create and keep the icons ready. The user can only switch on or off the icons of self or others. Can I use this on commercial sites? You may use this on any website – commercial, personal or multiple. No, there is no recurring fee.